Craig and I with the Flatiron looming behind us. 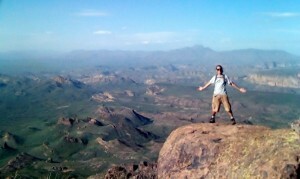 A month ago my friend Craig stopped at my house in Phoenix on his road trip across the US. His second day there he looked at me and said, “I want to go on a hike, and I don’t care how hard it is.” Well I looked right at him and said “I’ve got just the hike for you.” (with a devilish grin) The next morning we headed out bright and early to the Lost Dutchman State Park to cook breakfast and prepare for our hike up to the Flatiron via the Siphon Draw trail. The Flatiron is an iron like rock formation on the top of the Superstition Mountains located in The Lost Dutchman State Park. You gain 2,780 ft in less than 2.7 miles! (that’s steeper than most sections of the Grand Canyon.) 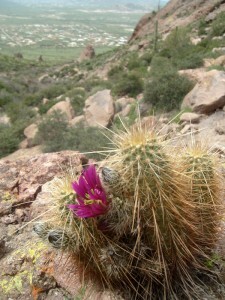 We hiked the trail in the middle of our blooming season, so the area was full of color with all the grass and flowers. Be careful if you hike this trail in the hot months, because it is extremely hot out the with very little shade. The top of this hike has amazing/terrifying views in all directions from the top and on the way up. Watch yourself once you get to the top because there is some very big exposure up on top of the Flatiron. Overall this hike is very difficult, but extremely rewarding. We spent over 7 hours out exploring, but you can hike the full trail round trip in about 3.5 – 5 hours. You can find more trail information by clicking here. The Lost Dutchman State Park is scheduled to close June 3rd, 2010 and ongoing discussions are being held to help find financial solutions to this park along with 4 other parks. This is already after 5 parks have been closed and 10 other park’s operation hours have been cut. 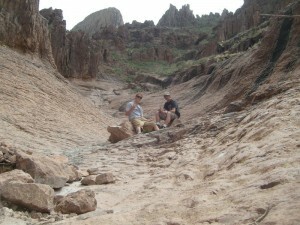 For more information on the closings contact (602) 542-4174 (outside of the Phoenix metro area call toll-free (800) 285-3703) or visit AZStateParks.com.